What about those who seem unlikable? What about people with whom you may have difficulty getting along? Individuals whose attitudes rub you the wrong way? I encourage you to make a list of people you do not like and begin to love them by faith. Perhaps your boss, a fellow employee, your spouse, your children or your father or mother is on the list of those whom you will love by faith. Pray for each person. Ask the Holy Spirit to fill you with Christ’s love for all of them. Then, seek to meet with them as you draw upon God’s limitless inexhaustible, overwhelming love for them by faith. Expect God to work through you! Watch Him use your smile, your words, your patience to express His love for each individual. Love by faith every one of your "enemies" — everyone who angers you, ignores you, bores you or frustrates you. People are waiting to be loved with God’s love. A homemaker who, through a long cold winter, had seen her family through mumps, measles, a broken nose, 3 new teeth for the baby and countless other difficulties, reached the point where these pressures and demands became too much for her. Finally, on her knees, she began to protest, "Oh Lord! I have so much to do!" But imagine her surprise when she heard herself say, "Oh Lord! I have so much to love!" You will never run out of opportunities to love by faith. "The fruit of the Spirit is love…" Like fruit, love grows. Producing fruit requires a seed, then a flower, then pollination, then warm sun and refreshing rains, and even some contrary winds. Similarly in daily life, your love will be warmed by joy, watered by tears and spread by the winds of circumstances. God uses all that you experience to work His will in your life. He is the one who makes your love grow. It is a continual, ever-increasing process. As Paul says, "May the Lord make your love to grow and overflow to each other and to everyone else…"
When you begin to truly love God by faith with all of your heart, soul, mind and strength and to love your neighbors as yourself, you will begin to see men as God sees them — as individuals of great worth, as those for whom Christ died. As a result, we shall be motivated by the same love which constrained the apostle Paul who said, "Everywhere we go we talk about Christ to all who will listen." Love, God’s kind of love, causes the Great Commission to become a personal responsibility and privilege. When non-Christians observe believers not only saying that they love one another, but also proving it by their actions, they, like their first-century counterparts, will marvel at "how they love one another" and will be drawn to receive and worship our Savior with us. Why not make this prayer your own: "Lord, You would never have commanded me to love had You not intended to enable me to do so. Therefore, right now, on the authority of Your commands for me to love and on the authority of Your promise to answer if I asked anything according to Your will, I personally claim Your love — the 1 Corinthians 13 kind of love — for You, for all people, and for myself. Amen." Remember, How You Can Love by Faith is a transferable concept. You can master it by reading it six times; then pass it on to others as our Lord commands us in Matthew 28:20 "Teach these new disciples to obey all the commands I have given you." The apostle Paul encouraged us to do the same: "The things you have heard me say in the presence of many witnesses entrust to reliable men who will also be qualified to teach others" (2 Timothy 2:2). 3. What does Romans 8:35-39 tell us about God’s love? 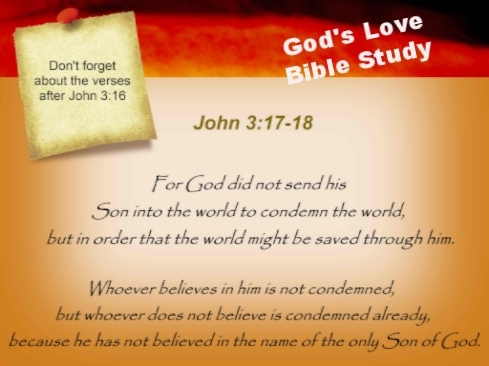 2) According to Jesus, which is the best way to approach God and express our love?